Ready for spells that are really different? Not just unique or odd, but utterly strange? Then look no further! 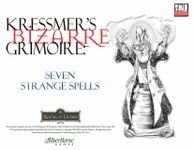 Culled from the private spell collection of renown gnome wizard, Kressmer the Odd, this selection of bizarre arcana will definitely set your character or NPC apart!